Yesterday we took a very enjoyable trip to the farmers market. I excitedly purchased the raw milk farmers cheese we discovered last year but couldn’t have because I was pregnant. The size of the market and the number of vendors has increased so much since last season! Very exciting to see. I spoke briefly with the market manager about having a tent next year when I return from Maine. That means I need to get my craft on these next 11 months! I purchased an all natural diaper cream that doesn’t negatively effect the absorbency nor stain cloth diapers. this inspired the purchase of 6 more cloth diapers. X is getting closer to being a fully cloth diapered baby every day. I find the progress of the farmers market really promising. Moving here was difficult for me. Organic food is expensive and often hard to come by here. I couldn’t find a prenatal yoga class to take while I was pregnant. Locally owned shops and restaurants are scarce, being an area with mostly chain dining and big box mega stores. There’s a Starbucks on every corner, but I’ve only found one local coffee shop. This is all very different from the Eco and health conscious town I moved from in Maine where local business is thriving. But the farmers market gives me hope. The progress of downtown gives me hope as well. There are a few like minded people here and hopefully this community will thrive and grow. All of the fresh produce was so beautiful. I must admit, I can’t wait for X to start eating solids. I’m going to make my own baby food and am really looking forward to coming up with recipes and seeing what he likes. He will be 4 months in less then 2 weeks, but I’m going to wait the 6 months. I know the health benefits of waiting. Who would have thought that after 28 years this little man would finally teach me patients. Shortly I’m heading back to Maine for a year. X and I will be staying with my grandmother. They just started a new farmers market right across the street. As soon as I get there I’m going to start buying fresh, organic produce and filling the freezer with baby food. I’ll be sure to document my process once I start. This is a great cloth diapering resource. A large chart of ways to disinfect cloth diapers and different conditions the products work for ie: flu, mold, etc. How to Disinfect Your Diapering Products. The first decision I made as a mother, after deciding to have a baby, was to cloth diaper. I hated the idea of chemicals against their skin constantly, the amount of diapers and time they spend in a landfill is frightening, they’re cost effective, they’re even cute! After doing some (well, a lot!) of research I decided to go with FuzziBunz cloth diapers. I put them on our registry, and that’s where they stayed. Cloth diapers are apparently not as fun to gift as cute outfits and toys. We slowly purchased the big necessity items thinking we’d get to the diapers eventually. Well, we didn’t. Fast forward to the stress filled, sleep deprived whirlwind of the first 2 months of a babies life. I was lucky if I managed to take a shower, never mind buying cloth diapers! Eventually things calmed down, or I got a better handle on things and I was able to revisit the world of cloth diapers. I read a few newer reviews saying FuzziBunz weren’t as absorbent as they used to be, this planted a seed of doubt. I didn’t want to spend $300, be unhappy with my choice and end up going back to disposables any way. So I was back to square one and not sure what to do. One day I was in Buy Buy Baby and they carry BumGenius cloth diapers. I bought 3 to try them out. 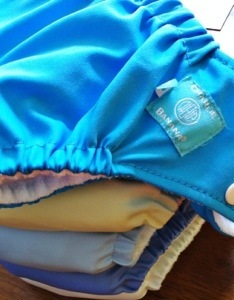 I thought they were pretty good and worked them into my diapering routine as often as I could. Then FINALLY my local Target started carrying Charlie Banana diapers. These had been my second choice to FuzziBunz in the beginning, but I couldn’t find them. I splurged and bought a box of six because the price equaled buying 5 and getting 1 free. I LOVE THEM! The adjustable elastic strap is really easy and much less hassle then I expected. They’re less bulky then BumGenius and the fleece inside is so soft. The fleece feels a little thin, so I’ll be interested to see how they hold up over time. So now I have 6 cloth diapers that I use regularly. But X being the little pooper that he is, that’s obviously not enough to cloth diaper exclusively. I plan to buy more, when finances allow, but until then I *almost* cloth diaper. Sometimes is better then never!